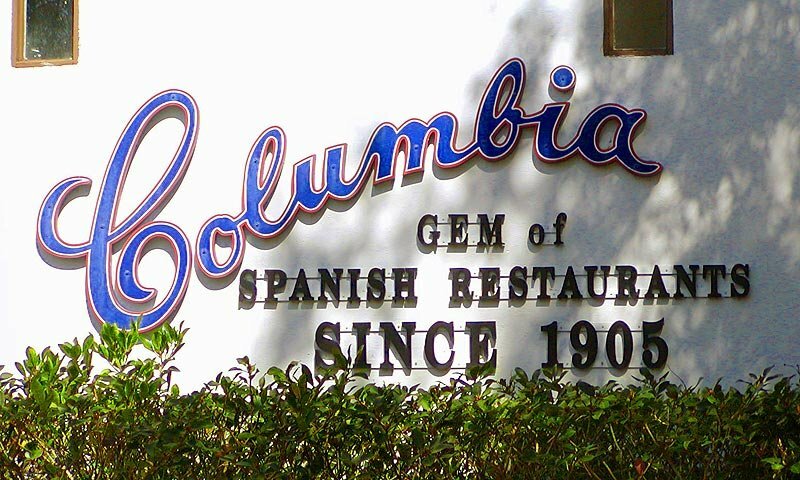 Cuban immigrant Casimiro Hernandez Sr. founded the Columbia Restaurant in Tampa, Florida in 1905. That location is Florida's oldest restaurant. 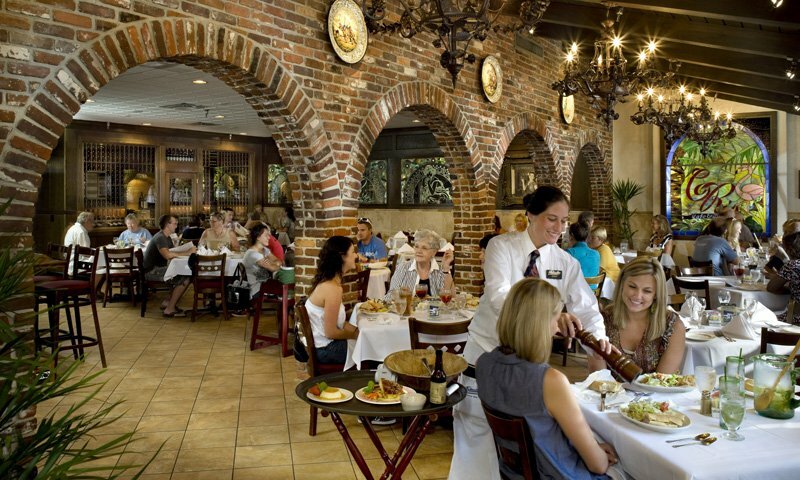 The Columbia Restaurant of St. Augustine is located in the heart of the city, at the corner of Hypolita and St. George Streets. 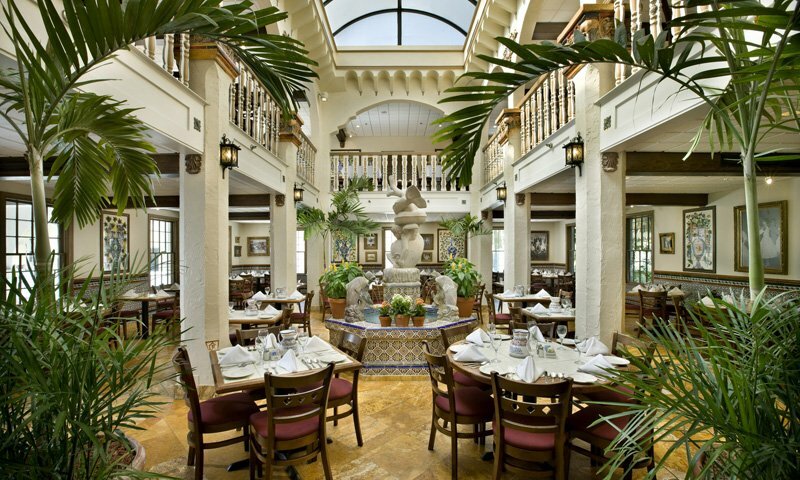 It offers award winning Spanish/Cuban cuisine for both lunch and dinner, seven days a week. The Columbia Restaurant is known for their excellent cuisine. Customer favorites include, pork, Black Beans and Rice, Paella, and Arroz con Pollo "Valenciana", (that's chicken and yellow rice.) The Columbia offers daily lunch and dinner specials. Sangria and Mojitos are a few of their drink choices in addition to their extensive wine list. At the Columbia Restaurant guests will be treated to the Old World charm and atmosphere of the rich and vibrant décor. 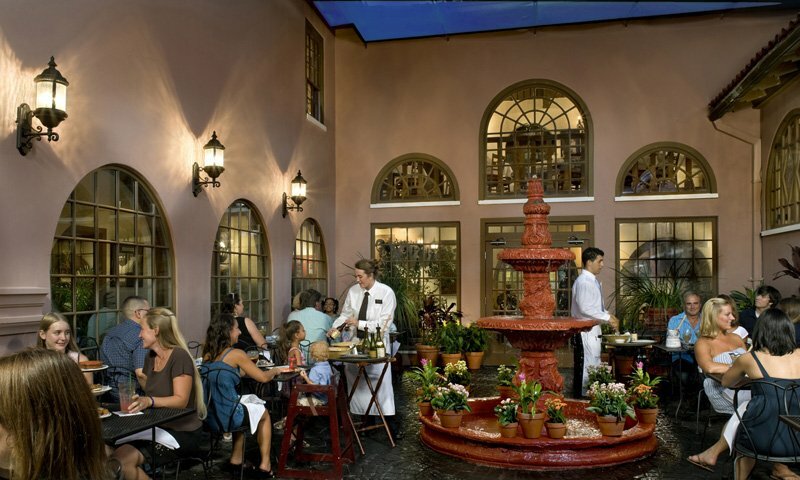 This restaurant truly brings a taste of Spain, right here to St. Augustine. With two floors of dining space, this is one of St. Augustine's larger restaurants. A new temperature controlled wine cellar is one of Columbia's true treats. 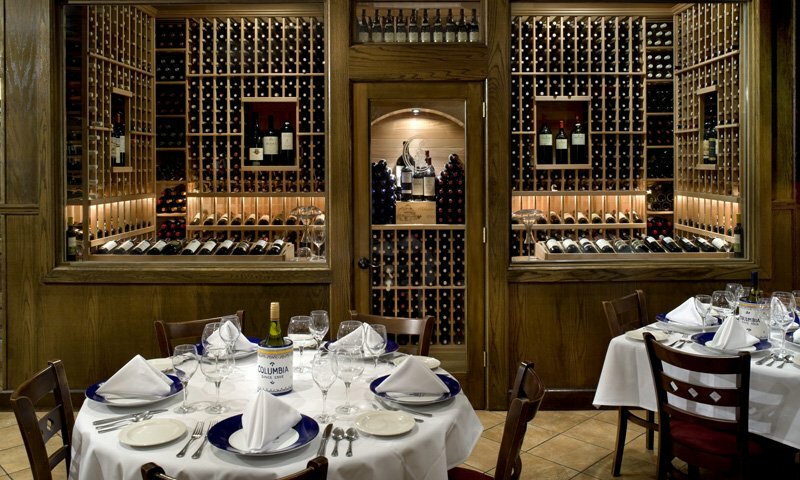 Choose from several thousand different selections of wine to accompany your meal at this fine dining restaurant. The Columbia Restaurant can accommodate groups of 10 to 200. They offer private dining areas to host your banquet, business lunch, rehearsal dinner, wedding reception, party or group event. Choose from their banquet menu, or let them customize a menu for your special occasion. Contact the Columbia Restaurant to make arrangement for your next event or dinner. The very best thing at the Columbia is the mojitos, the famous 1904 salad and the bread! If you're expecting more don't bank on it...Nice atmosphere. I've been here many times. I love the service, the waiters are always charming. I love the warm bread, I love the 1908 salad, I love their mojitos. The Columbia is comfortably elegant, and the prices are not outrageous. $14 for an entree is worth every penny here. The food comes right on time. not too quickly where you feel rushed, but you also won't be waiting for an eternity. Always great, Columbia. My niece had eaten at the original Columbia Restaurant and remembered the coffee especially. When she joined us in October we enjoyed a great meal with the Salad and the Cuban sandwich and the chicken and rice with peas. Our waiter Gary was most attentive and answered our questions and served us wonderful coffee and guava turnover--best dessert ever! Love the look of the place. Looking forward to returning in November!!! The prices are high, but the food and the service are excellent. We have enjoyed each visit very much. It is a nice change from everyday dining, and we really like the atmosphere. This was a regrettable experience! My husband and I recently went here on our Anniversary dinner and we were so disappointed. The food was extremely Over Priced!! Not very tasty and skimpy on the portion sizes. Also we got an appetizer, stuffed peppers with meat and cheese. It was bland, and some of the meat had gristle and nasty bone parts inside it! My bread that they brought out had a hair baked into it. So gross! I got the stuffed noodles with 4 tiny pieces of crab meat and pretty much a bowl filled of cheese sauce. My husband got meat with rice and vegetables. Our waiter was rude and not very attentive. Because we didn't order any alcoholic drinks he blew us off right from the start. They seated us right by the kitchen door which was very noisy and busy even though we called ahead and made reservations for a special and quiet dinner seat. If you don't mind spending $60 just for a dinner for 2 then this might be your place, but even then good food and cleanliness are always on my wish list.. We appreciate our money and felt like we were robbed when the bill came!! Oh and to make it even better, our waiter added a suggested tip to the bill hah! This place likes to ride on their building and beautiful interior. But, their 'famous' 1800s salad is nothing more than a greasy chef's salad. Their very expensive appetisers are grease laden and VERY small. I have eaten out a whole lot for 30 years and I don't think I have ever been as disgusted with the food quality as I have been with this restaurant. And, the prices are ridiculous for the quality of the food...NEVER AGAIN! I love ths restaurant!!! I have never enjoyed one like this before. The food is outstanding and that's just one part of it. If you want to feel like your back in old time St. Augustine than this is the place for you. You will want to stay for hours. We happened upon this restaurant by chance and it was the best move of our month long trip from New York. Our meal was absolutly fabulous and our waitress, Angela was just the best . She explained our meal and history and was just an absolute delight. Such an entertaining, lovely person that just made our meal a fabulous experience. Anyone visiting St, Augustine must visit and ask for Angela.